No-trespassing signs were set up after the cleanup started at 405 Denver St. N.E. The cleanup launched by the city of Albany at an abandoned house overlooking Bowman Park continues, and it’s turning into a huge job. But the eventual fate of the property remains uncertain. The place at 405 Denver St. 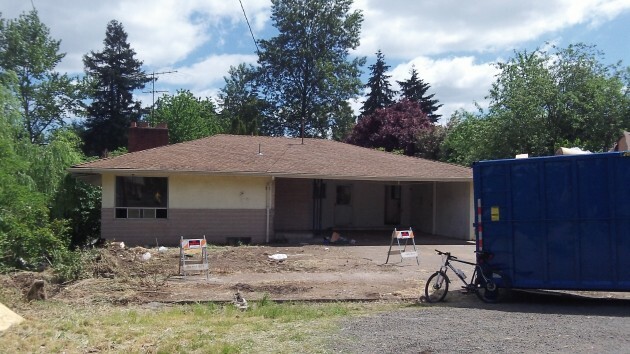 N.E., in the Willamette Neighborhood, is in a part of town that is part of my riverfront beat, so I’ve been looking at it now and then since it appeared on the city code squad’s list of problem properties. Transients had occupied the place from time to time, and the police were called there often. Last month the owner deeded the property to the city, which for the first time allowed the authorities to cite squatters there for trespassing. When I stopped by one afternoon last week, neighbors were working to salvage a few things from inside the house, which they said had been stuffed to the ceilings. The stink took their breath away when they opened a door. But they found some useful items, including textbooks and, according to one little girl, a wedding dress or two. At the time, the property was still open. Since then its been posted against trespassers, which after all was one of the main points of city intervention. The other was ridding the neighborhood of a terrible nuisance and a safety problem. The city arranged with the Linn County sheriff’s work crew — people doing court-ordered community service — to handle the cleanup. By Wednesday the crew had worked five days and had another two or three days to go. The city’s Rick Barnett anticipated the material removed from the house would total about 400 cubic yards and fill 10 Dumpsters. For the work crew, the Dumpsters, and sheets of plywood to seal up the house afterward, the city estimates a cash expense of about $11,000. Counting staff time and the use of city equipment, the total cost may run around $15,000. From the money standpoint alone, you can look on this as a big favor the city is doing the neighbors. The city council may assume that the city can sell the property once it’s cleaned up. But first it will have to reach an agreement with the mortgage holder, listed on county tax records as Specialized Loan Servicing of Highland Ranch, Colo. The lender has been paying the taxes, which last year were $4,540. I am not familiar with the property, but I am wondering if the land value is substantial. The assessor says the land value is $59,060 and the improvements are $210,720.